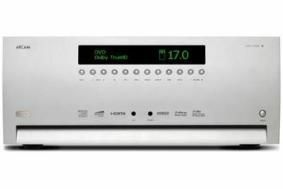 UPDATE: Arcam AVR500 to make its UK debut at Manchester Sound & Vision Show | What Hi-Fi? We've just received our first official pictures of the Arcam AVR500, and more details of its full technical specification which you can see below. And don't forget, you'll be able to see it for yourself at the Manchester Sound & Vision Show on October 17th-18th, before the unit goes on sale in December. There's been much chatter on our Forums about the new Arcam AVR500, baby brother to the AVR600, and now we can reveal that the new model will make its UK debut at the Sound & Vision Show in Manchester on October 17th-18th. Arcam has already released some details on its own website, following the model's unveiling at CEDIA Expo in the US last week, and now more technical info is beginning to emerge. The AVR500 is a seven channel design rated at 100W, and can decode all the latest high-definition audio formats. Initial indications are that it will sell for around £2500, a £1000 saving over the bigger model. To keep the price down, it loses the network card for internet radio, streaming and IP control fitted to the AVR600. It also has fewer video and audio outputs and multiroom connections. DAB and internet radio modules are expected to be optional.